So ya know the other day when I mentioned that I was the caretaker of 3 capons and one is trying to kill me? I guess it’s time you all got an explanation. The first day I was shown around the farm, I was introduced to the capon. A castrated rooster. Okay, cool. No big deal, it’s just another one of the birds. They’re supposedly a lot more docile, as they lack the hormones a regular rooster requires. I was not concerned about this. Until I was wandering around in the afternoon on that same first day, taking pictures. The chickens were pecking at the ground with the big capon nearby as they tend to do. They’re doing their thing by one of the apple trees, and I went to take some photos of the geese. I turn around, and there the capon is right next to me, staring me down. My host had warned me that sometimes he likes to flap a bit at people to exert his dominance, and so I tried to walk around him. Regardless, he flapped at me and I couldn’t even tell if he got much off the ground; a big bird flapping towards you is a bit startling, and I instinctively yelped and ran away. Mistake. Every teacher knows that the problem student should never be shown any sign of weakness and an animal is no different. I walked away totally freaked out, but figured it would be a one-time episode. Later that day, when we were feeding them again and I was in the chicken enclosure, it was obvious that the capon was watching me, even through the chicken wire. SO CREEPY. Day 2 was even worse. I was already timid about being around the capon after what had happened the day before, so I took a little stick with me while we were opening up the enclosures of the chickens, where the capon hangs out. 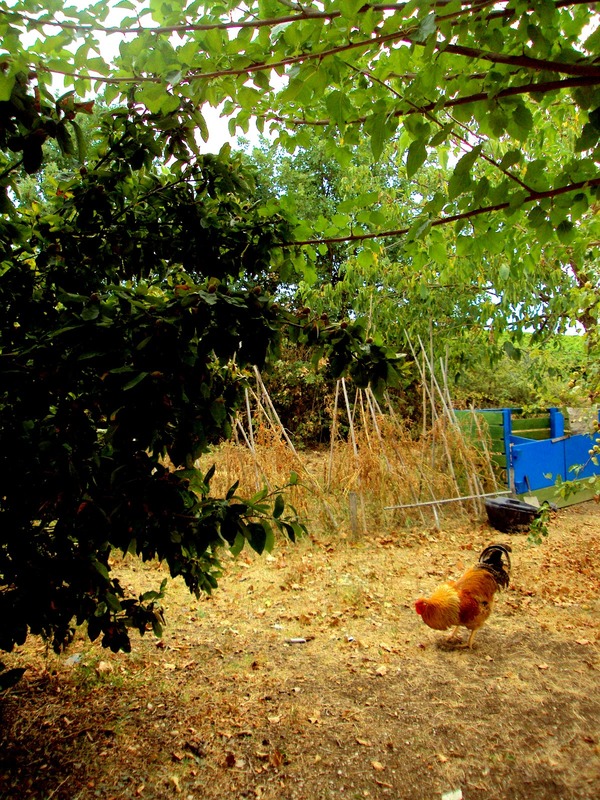 Usually, the chickens all run out and roam the farm during the day. The capon, however, decided to do something different. I had to leave the enclosure to turn on the water, I think. The capon stood in the doorway and stared me down. I had my stick, so I stood in front of him and kind of waved it at him. Nothing. Totally unfazed. Rob came over and started clapping at it, saying that that usually worked. Eventually Capon moved; I walked through the door and looked behind me AND HE STARTED CHASING ME! I literally screamed like a little girl and ran away (again. Wah wah). Rob was cracking up, and I did, too, and still do as I imagine what it must have looked like for a grown person to be running away screaming from a two-foot-tall bird. This episode, however, did not quell my fears of the blasted thing; rather, they amplified them. My host, laughing, said he had never seen him do that to anyone before. The damn thing smelled fear and I was wearing it as a perfume, apparently. I truly understand what Hitchcock was going for with the birds—their flapping wings, their talons. Ugh. From that point on, I started having a physical reaction whenever I saw the capon. The reaction was fear. My heart rate sped up, and I could feel the butterflies in my stomach flapping away. AT A STUPID BIRD. I felt so silly. I was sure to carry around a stick—a big one this time. I dreaded the next feeding time. That afternoon, I was attending to something and I noticed the capon was wandering by itself. We were heading the same way, and I really didn’t like the look he was giving me. So, I decided to accept his challenge. Rather than run away when he started walking towards me, I held my ground (and my stick). Bamboo out, I yelled at him all the instinctive things that came to my head. Most of it was just “HAAAAAA!” but a lot of it sounded like I was trying to be Robert De Niro. “Yeah, I’m watching you. Oh, you wanna fight? HAAAA! Come on! Yeah, that’s right, keep walking, punk.” Seriously, that’s about how the conversation went. After the yelling bit and getting the capon to go the way I wanted him to with some stick jabbing at the air, I felt a little better, although not completely satisfied. I was curious to see what would happen at feeding time. The dinner hour rolled around, and Rob came with me since I was still getting the hang of things. We kept our eyes on the capon as we went about our feeding and watering. I was in the enclosure checking for eggs and such, and I noticed the capon creeping a little closer. Rather than just waving the stick at it and yelling, I gave it a little poke and it actually made some contact with its breast. The beast flapped back a little and decided he would let me go for the time being. That poke changed things. Just the fact that his reaction was to back down once I had asserted myself more was heartening. It reassured me that he’s not some superpowered creature that’s invincible to flight or fight instinct. I am, after all, much bigger than he is. So, this morning (Tuesday), I thought things were a lot better. I was starting to do all the chores on my own, and with my trusty stick by my side I felt confident that my parents wouldn’t need to die of shame if I were killed by a barnyard bird, since that wouldn’t be happening. The butterflies had gone away, and with my trusty De Niro impressions, I was ready to conquer the world. Well, the bird enclosure, at least. The morning went without a hitch. The capon went where I wanted him to go when I wanted him to do it, and I wasn’t really scared while I was getting my work done. Fast forward a few hours, and it started to rain. Actually, it had been raining on and off all day, but the weather couldn’t decide whether it wanted to be a real downpour or not. I was in the main house, but had to run down to my apartment to get something. I turn the corner and what do I see? You guessed it: the capon. Where? IN FRONT OF MY BEDROOM DOOR. LOOKING INTO IT. EXPECTANTLY. (Okay, so perhaps the ‘expectantly’ description is an exaggeration, but that’s what it felt like…) I swore aloud in shock ran away and back up to the house to get my stick. To be fair to the capon, and to me, when I went back down and armed, he had gone. But I have no idea why he was hanging out there, because when it’s rainy the birds usually go into their enclosure to escape the elements, NOT INTO A HOUSE for crying out loud. What a stalker. HE IS SERIOUSLY SO CREEPY. Although I'm starting to wonder if he really is in love with me and not trying to kill me…I"ll keep you guys updated.